Same with most girls, I have items on my vanity table that I reach out for on a regular basis. 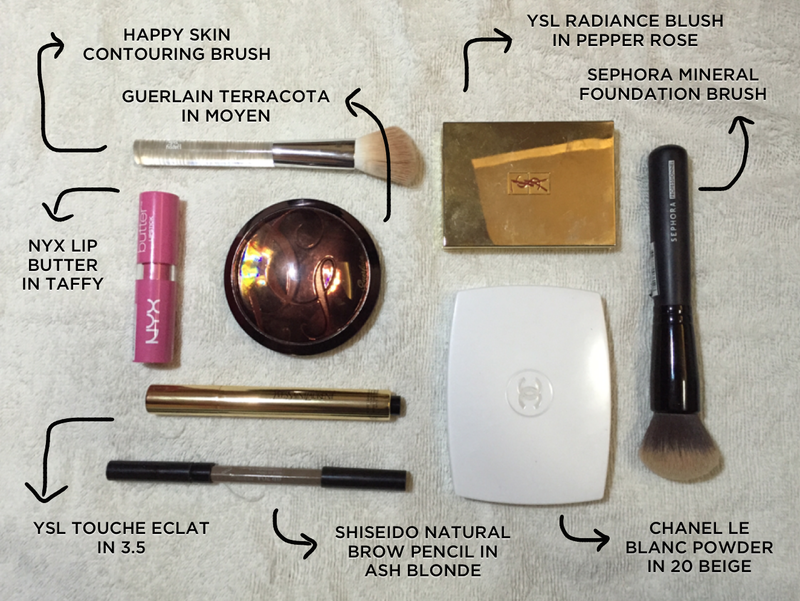 Depending on what look I'm going for, I tweak my daily makeup essentials every once in a while. I spend atleast 10-15 minutes applying makeup daily but I can decrease it to 5 minutes if I'm in a rush. If you don't need foundation/concealer, feel free to skip it! But for my case, I use foundation everyday. Lucky for me the product I use also benefits my skin. I have already shared in one of my previous posts what foundation I use. If you haven't read it yet, you can check it here: Happy Skin SS Cream Review | My everyday foundation! After that, I follow by setting it using my Chanel Le Blanc Pearl Light Compact Powder in the shade 20 Beige. The powder has a very velvety finish, which I love. It makes my face look radiant and smoother than it really is. Coverage is also good as it can cover mild dark spots. I use my sephora foundation brush in applying the powder. I don't simply just dust off the powder on my face, what I do is that I gently buff it around to make sure everything's all set. I then fill in my brows using Shiseido's Natural Eyebrow Pencil in Ash Blonde. I just follow my eyebrow's natural shape and focus on the spots that seem bald. I also make sure to apply as gently as possible using upward strokes. After that, I apply my Guerlain Terracota bronzer in the shade 05 Moyen to the hollows of my cheeks using my Happy Skin brush. Since I have a big forehead, some contouring in the area helps make it less noticeable. I apply it to the two sides of my forehead, building it slowly until the top part using the same brush. To add some color, I apply my YSL Radiance Blush in Pepper Rose to the apples of my cheeks. I bought it last July 2013, and I think it's part of their limited line for Fall. To complete the look, I add some color to my lips using my NYX Butter lipstick in Taffy. And ta-daa, I'm all set! I find this look appropriate for everyday, school, and work. It's light and dainty, nothing over-the-top. Welcome to daintydiaries! ☺︎ Here I ramble about my adventures, personal style, makeup, and whatever else that pops in my head.